NOVELTY LIGHT SET. This set of Banberry Designs black miniature (approx 3") lantern string lights are battery operated. Each strand has 10 hanging lanterns with 1 incandescent mini light. Each strand is approx. 7 1/2" feet long, so you can hang this anywhere. Since they are battery operated, you do not have to worry about hanging them close to an outlet. Perfect for camping, outdoor parties or events. HURRICANE LANTERN STYLE. Each little lantern lights up and is the style of an old oil lamp. This classic lantern design is perfect to hang from your camper awning, patio, porch, bistro, pergola, tent or deck. INDOOR/OUTDOOR DECORATIVE LIGHT. Use these cute, little black lantern lights anywhere. Since they are battery operated, they would go great in a mud room or entry way. PARTY STRING LIGHTS. 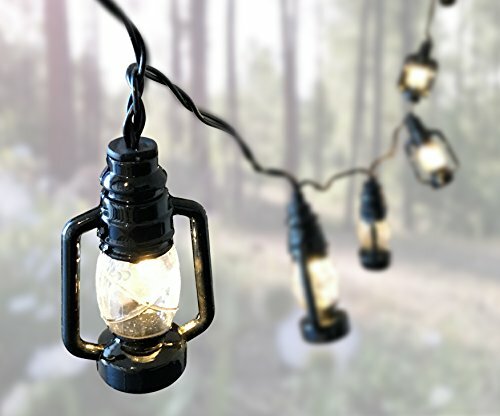 These little black camp lantern lights are approx. 3" H and you will receive 10 lights on each strand that measures approx 7 1/2" feet long or 90". They are also battery operated and require the use of 2 AA, (not included). If you have any questions about this product by Banberry Designs, contact us by completing and submitting the form below. If you are looking for a specif part number, please include it with your message.